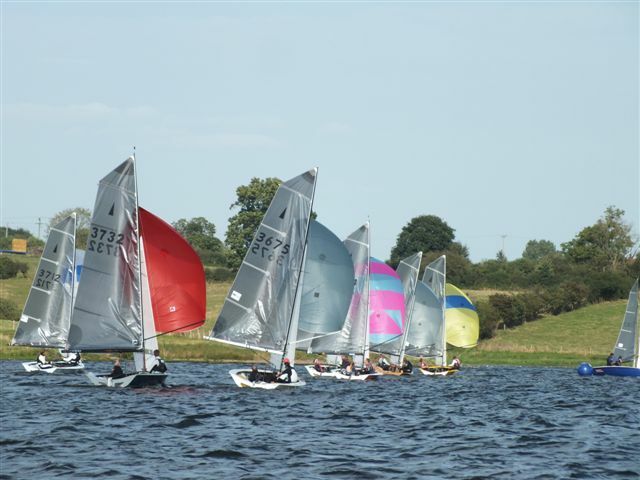 The Merlin Rocket Inland Championships, sponsored by Nautilus Yachting, descended upon Blithfield SC over the 15th/16th September. 56 boats attended making the trip to the large Staffordshire water. As is often the case when big events come round it was very much a “It’s not normally like this here” weekend, and while the weather in general was very nice the breeze was fickle in direction and while never a drifter variable in strength. It was certainly not a good weekend to be in the committee boat! The first start of race 1 was a taste of things to come, a 30 degree shift to the left made the pin end unlayable with 30 seconds to go and led inevitably to a general recall. The restart under black flag claimed a number of victims, some prominent home club sailors finding membership was no guarantee of diplomatic immunity! Richard Whitworth and Sarah Bines led at the windward mark and built up a large lead taking the bullet, Jon Gorringe and Toby Lewis came in second with home couple Steve and Gill “We always do rubbish at Blithfield” Leney taking third. 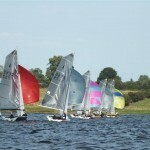 The second race was started under black flag, with a slight pin bias to tempt the fleet away from the committee boat. This race was serious snakes and ladders, with massive gains to be made if you found the right patch of breeze and just as easily lost if you were a few feet outside the gust. Rich Adams and Chris Gould from Midland SC took the bullet in this race, Jon and Toby proving consistant with another second and Matt Biggs and Ben Hollis third. By race three, the wind had built slightly to about force three with the odd lump in it, but any thought of this being a steadying influence was put to bed 30 seconds before the start when a huge shift, this time right, really set the cat amongst the pigeons on the line. Chris Martin and Tom Dunne made a perfect, if somewhat fortuitous, start right on the committee boat and led at the first mark where knot failure set in. In the process of sorting things out a small group of following boats assumed they were sailing the course – oops! Matt Biggs and Ben Hollis took over the lead at the second mark but had to settle for second as the charging Richard/Sarah took their third win placing one hand on the trophy overnight. 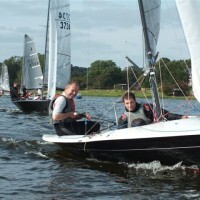 Dave Hayes and Johnny Ratcliffe came in third. It’s well known that the Merlin fraternity like a good party, and the state of the clubs bar stock on Sunday morning was testament too this with two empty lager barrels and three empty casks of real ale. a pig roast, jazz band and bar diving kept the fleet entertained until the early hours and Steve Leney’s morning hoovering of the clubhouse floor must have seemed like a very early start to those asleep on it! The breeze was slightly stronger than the previous day but though things looked promising at first, it turned out to be no steadier. Richard and Sarah were again flying and took the bullet with Andy Davies and Tom Pygall coming in close behind and Nick Craig and James Stewart third. Their win in the previous race ended the rush for first place, but there were four boats in with a shout at second. 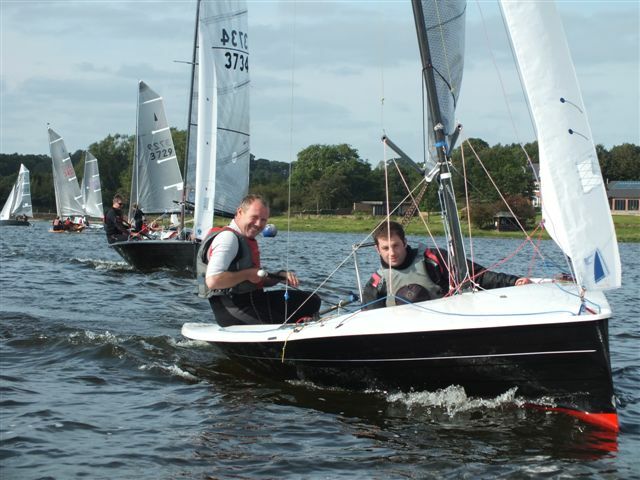 Nick Craig and James Stewart led the fourth race from start to finish, the consistent team of Jon and Toby came in second taking second place overall and Taxi and Tom coming in third placing them third overall. Thanks go to everyone who helped organise the event, Nautilus for sponsoring the prizes, and especially PRO Jim Woodward and his team for an excellent job in very trying conditions. 5 races, 4 to count.